“A family of entrepreneurs and innovators” is more than a lofty vision. The phrase is felt with our supportive working relationships, our friendly and fun outings and of course, the Friday morning breakfasts! Our patriarch and founder, Jim Hanna started his family enterprise in Crawford County, Arkansas in the early 1970’s. What followed were more drilling, employees and added generations of Hanna’s. Today the company is lead by Bill Hanna (2nd generation) and 3rd generation of Hanna’s now working for the company. With operations in the mid-continent and Canada, Hanna Oil and Gas is preparing for the next chapter. The company operates 350 wells in the Arkoma basin and has working interest in another 2000 wells in the midcontinent area. The company has also diversified in commercial real estate and healthcare. 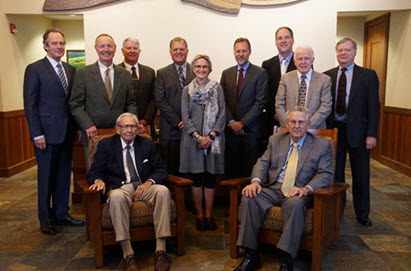 Hanna Oil and Gas has approximately 40 employees with several being with the company for 10, 20 and over 30 years. It is family owned, family operated and family strong. 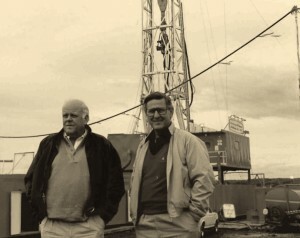 Hanna Oil and Gas was the creation of Jim Hanna in the early 1960’s. He grew up in Wichita Falls, Texas and was the son of hard working parents who were good providers. The best lessons he learned from his parents was to work hard and treat people fairly. He did those things very well. After working through college he graduated and went to work for rancher turned driller, J.S. Bridwell. Mr. Bridwell wanted a presence in the emerging Arkoma Basin in the late 50’s and early 60’s. 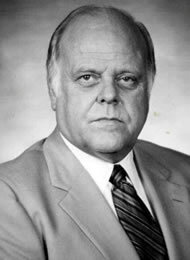 Jim moved to Fort Smith, Arkansas in 1960 and opened an office for Bridwell. He worked hard for two years to establish a presence. Mr. Hanna started his own company. He bought and sold leases and kept overrides. It was an existence, but not very profitable. He worked for 10 years doing this and was slowly going broke. He was however building a reputation as a man of his word and a work ethic that would carry him past his meager existence. In 1970 he bought a deal from JM Huber Company that would take him to the next level. The unit he bought had potential for a well in the risky Hale Zone, which was “downdip”. For others this would have been “not drillable”. Regardless, he sold the deal to investors (put his own money in the well) and drilled. It was the biggest well ever drilled at the time. The open flow was calculated at 165mmcf/d. To date the Lincoln #2 well has produced approximately 15 bcf of natural gas and is still producing after 43 years.